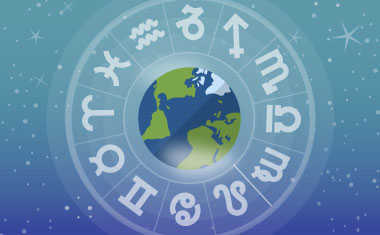 Hi I'm Brigit, founder of Biddy Tarot. I'm here today with the Monthly Tarot Forecast for June 2017. Our first card is the Seven of Swords reversed for our Blessing. 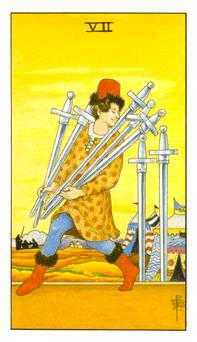 I tend to see the Seven of Swords as a card of being quite strategic, and choosing what you will do and what you won't do. This guy has chosen that he's going to take the swords, but not these ones -- because he can get away with these ones, but if he carries all of them, he'll probably get caught by the guys in the background. I see you starting to prioritize a lot more in the month of June, and becoming much more strategic about what you will and won't take on. Given that this is in the reversed position, this is a lot about aligning with your personal boundaries, and starting to get very clear about what your priorities are. It really is just about honoring you -- honoring your time, your energy -- and setting those personal boundaries around where you can realistically devote yourself and where you cannot. 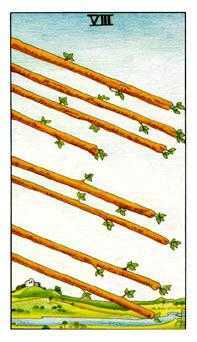 Now, in terms of our Challenges, we've got the Eight of Wands reversed. This can play out in a couple of different ways. Typically I see the Eight of Wands reversed as a card of delays; things just are not moving along as quickly as you had hoped. Just make sure that you've got a little bit of extra time up your sleeve because it may take a little bit of extra time for it to actually manifest, and things might slow down during this month. Also if you are traveling you may find that you get delays as you travel, so don't leave things too close to the wire. Our final card for June is the Four of Wands, and this is our Recommended Action for this moth. 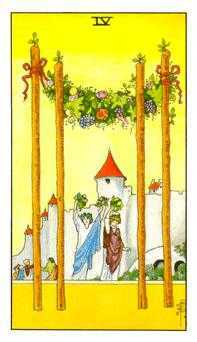 I love the Four of Wands, it's all about coming home. It doesn't necessarily mean coming back to your actual home, but coming back to a place where you feel comfortable and supported, and you're around friends and you can just relax and have fun. So think about what is your home that you can come back to. Where can you find a place to just relax and be yourself and enjoy? Maybe this is a great time to have some time off from work, or even to go on your own personal retreat somewhere. Just enjoy, have fun, make the most of it. You don't have to be working all the time, you don't have to be serving other people, you don't have to be busy all of the time; it's OK just to slow down. Remember back with our Seven of Swords, you might just have to put a few things off until next month, so that you do have that time just to relax and slow down.